I have an Android device. 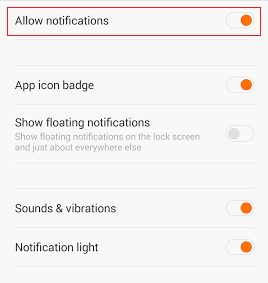 How can I check if notifications are enabled for the Socioh Instagram app? When you install the Socioh Instagram app, you need to give it permission to send you notifications. This video will explain how the app works - https://www.youtube.com/watch?v=40auYjgWov8. You will not receive Instagram posts unless you enable notifications. 1. Go to ‘Settings’ on your phone. 3. Click on ‘Manage Notifications’. 4. You’ll see all your apps listed there. Click on ‘Socioh’. 5. ‘Allow notifications’ should be enabled. 6. If notifications aren’t enabled, you can enable them from here.